A felony warrant has been issued for the arrest of rapper Snoop Dogg (real name: Calvin Broadus). He has been charged with one felony count of possession of a deadly weapon. According to law enforcement officials, Snoop attempted to walk through an X-ray machine at John Wayne Airport in Orange County, Calif. with a 21" collapsible baton packed in his laptop computer case on September 27th. Orange County Sheriffs' deputies were called to the scene where they detained the rapper and confiscated the weapon. Bail is set at $150,000. 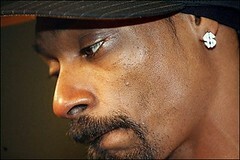 If convicted, Snoop faces a maximum of 3 years prison sentence.